Amanda Hocking is 26 years old, lives in Minnesota and had not sold a single book before 15th April 2010. She has now sold over one million ebooks. She is a self-publishing phenomenon. Her bestselling Trylle Trilogy is now to be available in paperback and ebook formats with additional, unseen and exclusive content. Acquired through a fierce international auction, Pan Macmillan will publish Switched, the first in the trilogy in January 2012. Followed by Torn in March and Ascend in April. Amanda Hocking’s previously unpublished and highly anticipated new Watersong series, will also be published by Pan Macmillan from September 2012. 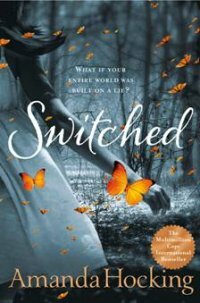 Switched introduces the reader to Wendy Everly. She first knew she was different the day her mother tried to kill her, accusing her of having been switched at birth. Although she’s certain she’s not the monster her mother claims she is, there is a secret she keeps from everyone. Her mysterious ability to influence people’s decisions, without knowing how, or why.